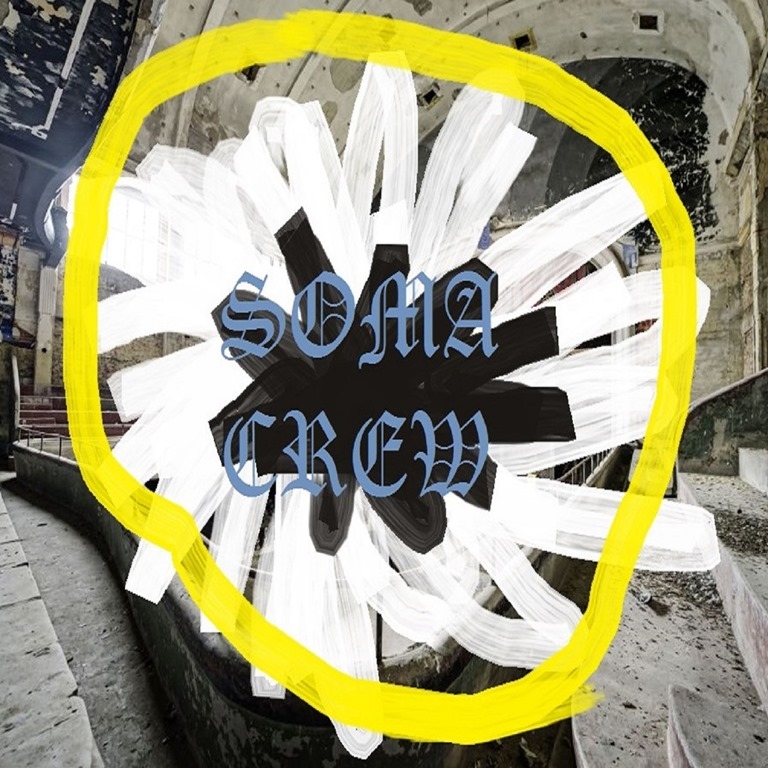 A year or so back, maybe, from the ashes of York-based psychedelic drone act Muttley Crew emerged York-based psychedelic drone act Soma Crew. Sort of. The same band in essence, it was undoubtedly time for a change of name, but there’s been something of a lineup reshuffle in the process, and, on the evidence of this, the first Soma Crew EP, a sonic evolution too. This means that while there are still heavy hints of Black Angels, and the songs are still built around two or three chord chugs swathed in layer upon layer upon layer which twist and turn over the course of six minutes or more, there’s new stuff going on which wasn’t present on the Muttley Crew album which came out in the Spring of 2015. With a ragged guitar sound and Simon Micklethwaite’s vocals adopting a sneering, drawling tone, there’s a punk edge to the EP’s first cut, ‘Pulp’. After a left-turning detour around the mid-point, it bursts into a raging racket of dissonance. And all the while, the drums keep on hammering out a relentless mechanoid rhythm, holding it together while everything else collapses to beautiful chaos. The slow-burning ‘Path With Heart’ brings it down a notch or two and offers a more low-key and introspective aspect. It’s exactly the music you’d expect from a band named after a muscle relaxant which works by blocking pain sensations between the nerves and the brain. ‘Vital Signs’ is perhaps the first track here that’s truly representative of their live sound, a motoric droner, with murky, overdriven and reverby guitars yawning and veering across one another over a thumping locked-in groove with no let up for over six and a half minutes. The eight-minute ‘Prizefighter’ begins at a lugubrious crawl. It takes its time… and then the overloading lead guitar breaks in, noodling in a smog of a chugging rhythm to drive it to the end. The rough edges and hazy production give the songs an immediacy, and beneath the layers of reverb and cavernous delay, there’s a pulsating energy that gives EP 01 (aka Soma) a rare vitality. Rebirthed, re-energised, this band may be habit-forming and should be used only by the person it was prescribed for.